Off-road recreational vehicles can provide a fun way to explore the countryside. One popular model is the side-by-side, also commonly referred to as a UTV (or utility task vehicle). In addition to recreational purposes, these vehicles can be useful for work outdoors. But if you wreck or damage your UTV, you may need the cash to buy another one or pay medical bills. It is very difficult to sell these vehicles online because buyers typically want to see how bad the damage is and get an idea of what is salvageable or the cost to repair the side-by-side. We can make your life easy by providing an instant offer, picking up the UTV and handing you a check on the spot…all done the same day in most cases. Selling your wrecked or damaged UTV or Side-by-side just got easier and faster with the help of The Bike Buyers. Customers can sell a wrecked or damaged side-by-side (UTV) in any condition, any make, any model, anywhere in the US. 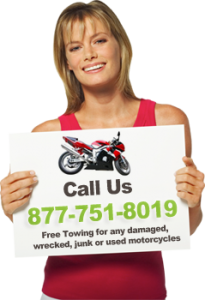 We purchase all wrecked or damaged side-by-sides, motorcycles, choppers, scooters, sport bikes, jet skis, sport touring, dual sport, dirt bikes, ATVs…. even Harley Davidson, BMW and custom trikes! We have been helping riders sell their unwanted vehicles for over 25 years. With 350 offices through out the USA, we have an office near you…. so go ahead and call The Bike Buyers at 877-751-8019 to get an offer and check today.